Last week, Simms Fishing Products, best known for its waders, boots and extended fishing apparel, appointed outdoor industry veteran and lifelong angler Casey Sheahan as its CEO. K.C. Walsh, majority owner and longtime President of Simms, became the company’s executive chairman. Sheahan is best known as CEO of Patagonia from 2005 to 2014. Under his leadership the company tripled its profits and experienced significant growth. Also during that period, Patagonia launched their Common Threads Program, an industry-leading recycling program. He has served many other roles in the industry, including president of Kelty, VP of marketing at Merrell, category marketing manager at Nike ACG and the editor/publisher at POWDER Magazine. Most recently, he was president of Keen. Here, Sheahan talks about his passion for the sport of fishing, a wide array of growth opportunities he plans to pursue at Simms, and his commitment to conservation and driving more people to the sport of fishing. Can you talk about the role the sport of fishing has played in your life? CS: Why fishing/love of sport? I have been fly fishing since I was a little kid spending summers in Jackson Hole, WY. My dad gave me a Russ Peak combo spin/fly rod that I used to entice cutthroat trout in the local lakes and rivers. The obsession only grew over time and I idolized some of the valley’s fly fishing guides as a teenager. In the early ‘70s I ran shuttle for local ski patroller/guide/product innovator and Simms founder John Simms when he was running guided trips down the Snake River. Before I became CEO of Patagonia in 2005, Yvon Chouinard tested me out by having me run his favorite category, fishing, for nine months, so the fishing lifestyle as a business opportunity is not new to me. Which past positions prepared you for this job? CS: Simms is making innovative apparel, waders, footwear, bags and packs for the sport fishing enthusiast. My past leadership roles at Patagonia, Kelty Packs, Nike, Merrell and Keen Footwear apply directly to the opportunity for Simms to be a new leader in the outdoor lifestyle space. We are focused on enhancing our customers’ days on the water by keeping them warm and dry on cold days or, alternatively, protected from the sun and insects on hot days, so all my prior experience comes into play here. For 2018, we are building product for all the ecosystems an angler will encounter around the world — in rivers, lakes or oceans. Both materials selection and design are critical to having our customers thrive on the water no matter where they are, no matter what time of year. Is there a solid growth opportunity for the fishing business overall at retail? CS: There is an opportunity for Simms with its fly fishing heritage to expand into the bigger, broader sport fishing market — it’s also a technical market but obviously different from a technique and gear standpoint. The environmental protection needs are the same. We also are excited by our growth in men’s and women’s sportswear, t-shirts, hats and accessories as this kind of product turns faster at point of sale. The market share winners in fish are those who can translate their technical heritage into product that transitions authentically from boat to the bar. Why were you particularly attracted to Simms? CS: I was attracted to this brand not only because of my passion for the sport but also to the great group of people here in Bozeman. 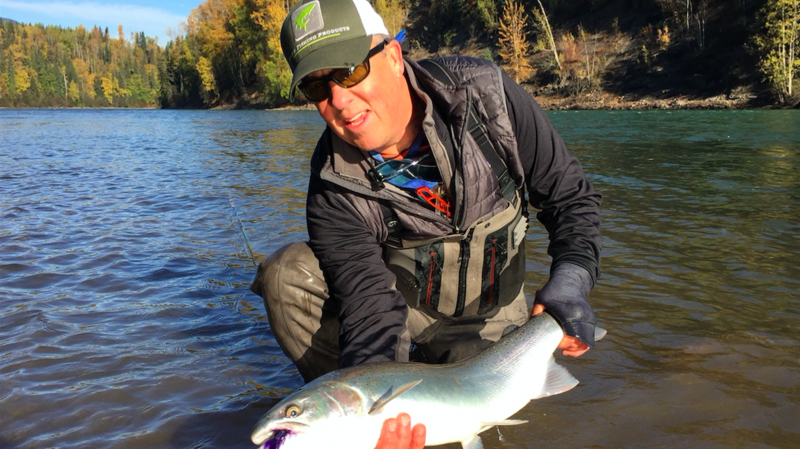 I have known owner KC Walsh for more than 20 years and have seen how his singular focus on making the best technical wading product and protective apparel has propelled this brand. EVP of marketing Al Perkinson came to us from Costa Del Mar and its strong saltwater focus and is building an exciting new brand platform to help us engage more inclusively with younger customers. VP Global Sales Mike Moore is one of my long-term fishing companions and has deep experience and contacts driving sales strategy with brands like CamelBak and Thule. Our product and operations EVP Lee Fromson has held leadership positions at REI, Cascade Designs and Goal Zero. And VP Finance Weston Fricke has been driving the company’s strategic and financial growth for almost 10 years. We also enjoy the benefits of a strategic investment relationship with Castanea Partners in Boston. They are a true partner in our business, and their advice and support will be critical to our success. The element that “sealed the deal” for me was the Bozeman operation. After years working with multinational brands that that have complex global sourcing and supply chains, it is great to see a high-end wader manufacturing facility here in Bozeman. Simms is fortunate to have 180 people that are dedicated to being a leader in everything that we do, from products to community interaction. And they are very fishy people, so I should have no shortage of fishing partners. Where are Simms’ untapped opportunities? CS: Our roots are in fly fishing but we know we can help all kinds of angler have better days on the water. Common ground for us is loving, respecting and enjoying our fisheries – we can appeal to any angler who is fired up about this sport. Women’s, kids, newcomers are all potential growth opportunities for the sports fishing industry and Simms. What changes are necessary to take outerwear, sportswear and footwear to another level within Simms? CS: We need to make the most badass technical apparel possible to allow anglers to focus on the fishing in the harshest environments, from blazing hot tropical reefs to frigid rivers, and we need to make product that simultaneously looks and functions great when we aren’t angling. That was the lesson of my experiences at brands such as Patagonia. At Simms, we are singularly focused on fishing. We are our own toughest critics and ultimate end users. If this team doesn’t believe in what we are making or want to wear it themselves, then we won’t bring it to market. What challenges do you see ahead for the brand? CS: Here in Montana we are increasingly affected by river dewatering and high summer temperatures. Stream access laws are continually being challenged. Mining practices, logging and global climate change are affecting water quality in freshwater rivers and lakes around the world. Our oceans are impacted by overfishing, pollution and acidification. All these environments are our customers’ playgrounds and we will add our voice on behalf of the rivers and other waters which can’t speak for themselves. With no resource, there is no fishing and no fishing related businesses, so we must not only advocate for ourselves but also all of our customers who need a healthy environment to live and play in. What are your goals for Simms? What changes should retailers expect? CS: We are increasingly focused on supporting our partners with compelling retail build-outs and visual merchandising and our need to create segmented product stories so that we can offer each channel the products that resonate with the consumers they serve. We believe our omni-channel strategy puts the consumer at the center of the buying experience no matter where he or she finds us. We want the brand to be even more indispensable, and we strive to be the most trustworthy, reliable partner we can be. On the product front, expect more air-conditioning fabrics and constructions, more sophisticated traction solutions on the deck and in the water, and new camouflage technologies to conceal the angler in river and ocean environments. Will you be relocating to Bozeman? CS: I moved here with my wife Noreen in early November. We are building a house near town and have our little fishing raft parked behind Simms headquarters. We are really looking forward to enjoying the local skiing opportunities and the start of trout season once the ice melts off! You lasted at Keen less than two years. What happened? CS: Ha, ha. Next question! No seriously, Keen is a wonderful value-based brand run by passionate people and we loved Portland and its proximity to great steelhead fishing on the North Coast, but at the end of the day we wanted to be back in the Rocky Mountains closer to my family. Montana is beautiful and if you are a fisherman, there is no better place to be. The chance to help K.C. Walsh run Simms was a perfect match-up of avocation and vocation. K.C. wants to focus on our innovation engine, our key vendor relationships and being the top ambassador for the brand and the industry he loves. I will focus on the day-to-day product-centric strategies, nurturing this great team, and generating the best design and product marketing possible. I really believe this is a special once-in-a lifetime opportunity to help Simms build on its core fly fishing heritage to reach new, younger consumers who are turned on to this exciting, healthy lifestyle. I feel like my whole life and career path has led up to this job at this moment. I am psyched to be here. You’re known as an advocate of sustainability and eco-causes. Do you expect to help Simms double down on such efforts? CS: Short answer, yes! Protecting our natural resources has always been and will always be important to Simms, and we have a strong track record of support to many organizations that play a critical role in habitat and species protection. One of the benefits of K.C. Walsh stepping up to the executive chairman role for the brand is that he will now have the time to double down on our conservation efforts. A week ago, we took a bus full of company employees plus a few trucks towing rafts and drift boats to attend a Department of Environmental Quality hearing in Helena (Montana’s state capitol) on a proposed copper mine near the headwaters of the Smith River. K.C. and several other company leaders spoke out against the possibility of mine tailing point-source pollution causing the destruction of this iconic river and its importance as a recreational and business resource to the guiding/outfitting community in Montana. The Smith River is a cornerstone effort in our Save Our Streams initiative in which proceeds from limited edition S.O.S. t-shirt sales go to protecting rivers and other threatened areas from potential pollution. There are other programs we also support such as Warriors and Quiet Waters and Casting for Recovery. Simms has been hyper-engaged here and these will continue to be programs we are hugely involved in, as well as others we haven’t yet conceived. We believe in the transformative powers of fishing on those that are really struggling with PTSD or cancer recovery. Or just need a break from their hectic lives. I remember the movie, “A River Runs Through It,” introduced many Boomers to fly fishing. Are any trends working for or against the sport of fishing? Is it reaching the younger generations? CS: I personally believe there is a new generation of anglers that are interested in new species and maybe even less concerned with what type of rod they are using to catch them. Fishing is a super social sport that connects you with friends and family and is sharable in the moment, around a campfire and through social media. Millennials are looking for experiences and fishing is the ultimate experience. I have been fishing for almost 60 years. The power of this sport to get people outside enjoying the environment, slowing down and enjoying the moment has long-term health benefits and appeal. Our goal at Simms is to get more people to come fishing with us.